Tuesday May 8th 1883 Bridget did the washing this forenoon but did not put the clothes out. I was at work about the house all the forenoon but did not feel well so I slept all the afternoon. played in the evening Wednesday May 9th 1883 Mother went to town this morning and brought Hatt and Edith with her. It was very warm in the morning but rained most of the afternoon It stopped after supper so Hatt went home. This was her birthday she is now twenty six years old. I began a little cap for Amanda Andersons baby. 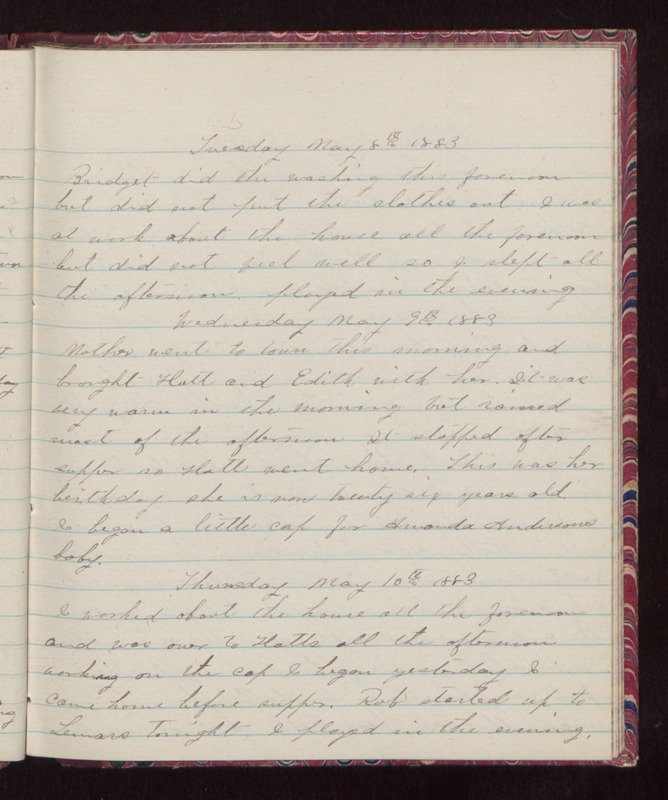 Thursday May 10th 1883 I worked about the house all the forenoon and was over to Hatts all the afternoon working on the cap I began yesterday I came home before supper. Rob started up to Lemars tonight. I played in the evening.